In battery-operated devices that have removable batteries, you usually need to prevent the batteries being connected the wrong way to prevent damage to the electronics, accidental short-circuiting, or other inappropriate operation. If that is not possible by physical means, you need to include some electronic reverse current protection. Physical protection can simply mean a polarized connector or a battery with offset connections (as with most mobile phone lithium batteries) in combination with instructional symbols and pictures. For AAA or AA size batteries there are holders which are designed so if the battery is placed the wrong way round, one end will not make contact. There are still circumstances where physical means are not possible such as with most coin cells or if the user can connect power by wires to screw terminal blocks. Hence, this could apply to non-battery operated devices as well, and is likely to apply to automotive electronics. 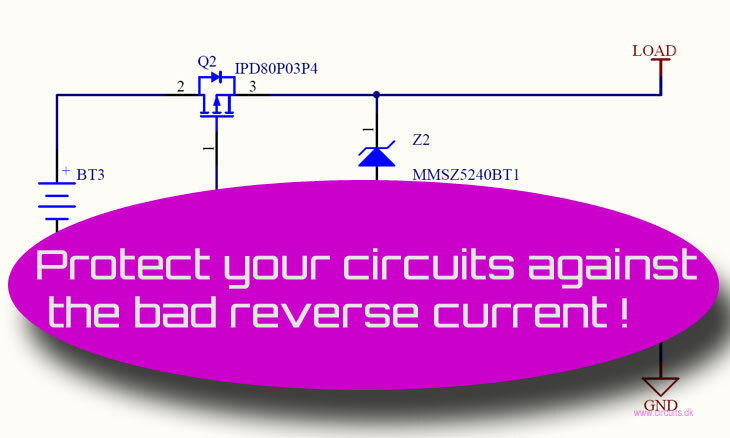 Hence, electronic product designers and manufacturers must ensure that areverse currentb reverse current flow and reverse bias voltage is low enough to prevent damage to either the battery itself or the product`s internal electronics. Why not use a simple diode? Using a diode as reverse power polarity protection as shown in Circuit 1 is a very simple and reliable solution as long as you can afford the waste of power. The chances are that with a battery-operated device you do not want to waste power, particularly if your supply voltage is already quite low and so the voltage drop of 0.3V or 0.4V from a schottky diode will be significant and unacceptable. For higher supply voltages in the range 9V-48V and automotive applications, a small voltage drop may not matter, especially if the current is low. At high currents, above 5A, temperature rise due to the high power loss may be a concern. You do not want the diode to get too hot so adding a heatsink most likely will be necessary. The price of a schottky diode is higher than an ordinary diode, but the loss is significantly lower. Be aware of that a lot of schottky diodes have pretty high reverse current leakage, so make sure you choose one with a low reverse current (around 100uA will be fine) in a battery protection circuit. At 5 amps the power loss in a schottky diode will typically be: 5 x 0.4V=2W versus an ordinary diode: 5 x 0.7V=3.5W. A good candidate diode for use in a reverse current protection application is a new type of diode called Super Barrier Rectifier (SBR) is a proprietary and patented Diodes Inc. technology that utilizes a MOS manufacturing process (traditional Schottky uses a bipolar process) to create a superior two terminal device that has a lower forward voltage (VF) than comparable Schottky diodes while possessing the thermal stability and high reliability characteristics of PN epitaxial diodes. Super Barrier Rectifier (SBR) diode is designed for high power, low loss and fast switching applications. The presence of a MOS channel within its structure forms a low potential barrier for the majority carriers, thus SBR’s forward bias operation at low voltage is similar to Schottky diode. However, the leakage current is lower than Schottky diode in reverse bias due to the overlap of the P-N depletion layers and the absence of potential barrier reduction due to the image charge. TRENCH SUPER BARRIER RECTIFIERS (SBRT). Trench SBR is the next evolution that gives us the performance member in the SBR family. By using a highly advanced trench technology, SBRT offers an even smaller VF for applications where ultra-low forward voltages are important. While further technology enhancements are being continually applied to the SBRT, these efforts result in the ever more advanced and power friendly member – SBRTF. For more information, please visit the Diodes Inc. website. The most recent N-MOSFETs are VERY low on resistances, much lower than P-Channel types and therefore, are ideal for providing reverse current protection with minimal loss. Circuit 3 shows a low-side NMOS FET in the ground return path. The FET’s body diode is oriented in the direction of normal current flow. When the battery is installed incorrectly, the NMOS FET’s gate voltage is low, preventing it from turning on. When the battery is installed properly and the portable equipment is powered, the NMOS FET’s gate voltage is pulled high and its channel shorts out the diode. A voltage drop of RdsOn × ILOAD is seen in the ground return path when using the NMOS FET. Some of the latest N-FET’s threshold voltages and RdsOn’s usable for reverse current protection are listed in Table 1 and higher current types in Table 3 further down this page. Inserting the N-MOSFET in the ground circuit will introduce a ground shift that may not be acceptable in all applications. That may cause trouble for sensitive applications (Automotive systems for example) with one or several connections to maybe sensors, communication busses, and actuators, external to the circuit. To be able to use the N-MOSFET as a reverse current protector in the high side power path requires a gate voltage greater than the battery voltage to turn the MOSFET on. This requires a charge pump circuit, which increases circuit complexity and component cost, and can also introduce EMI challenges. A comparably sized P-channel MOSFET will have a higher RdsOn and hence higher power losses but can be implemented with simpler drive circuitry comprising a zener diode and a resistor. The most recent MOSFETs are very low on resistances, and therefore, are ideal for providing reverse current protection with minimal loss. Circuit 2 shows a high-side PMOS FET in the power path. The FET’s body diode is oriented in the direction of normal current flow. When the battery is installed incorrectly, the PMOS FET’s gate voltage is high, preventing it from turning on. The zener diode will protect against exceeding the recommended gate-source voltage and may not be required, depending on your input voltage range and the MOSFET used. To protect against possible voltage spikes and transients from destroying the MOSFET, a pair of tranzorb diodes could be added at the input as in Fig. 3. The capacitor between gate and source is added to ensure the circuit works well when there is a rapid change in input voltage polarity. When the battery is installed properly and the portable equipment is powered, the PMOS FET’s gate voltage is driven low and its channel shorts out the diode. A voltage drop of RdsOn × ILOAD is seen in the power path. In the past, the primary disadvantage of these circuits has been the high cost of low RdsOn, low-threshold voltage FETs. However, advances in semiconductor processing have resulted in FETs that provide minimal drops in small packages. Some of the latest P-FET’s threshold voltages and RdsOn’s are shown in Table 2. The LM74610-Q1 is a controller device that can be used with an N-Channel MOSFET in a reverse polarity protection circuitry. It is designed to drive an external MOSFET to emulate an ideal diode rectifier when connected in series with a power source. A unique advantage of this scheme is that it is not referenced to ground and thus has Zero Iq. The LM74610-Q1 controller provides a gate drive for an external N-Channel MOSFET and a fast response internal comparator to discharge the MOSFET Gate in the event of reverse polarity. This fast pull-down feature limits the amount and duration of reverse current flow if opposite polarity is sensed. The device design also meets CISPR25 Class 5 EMI specifications and automotive ISO7637 transient requirements with a suitable TVS diode. The LM74610 is a zero Iq controller that is combined with an external N-channel MOSFET to replace a diode or P-MOSFET reverse polarity solution in power systems. The voltage across the MOSFET source and drain is constantly monitored by the LM74610-Q1 ANODE and CATHODE pins. 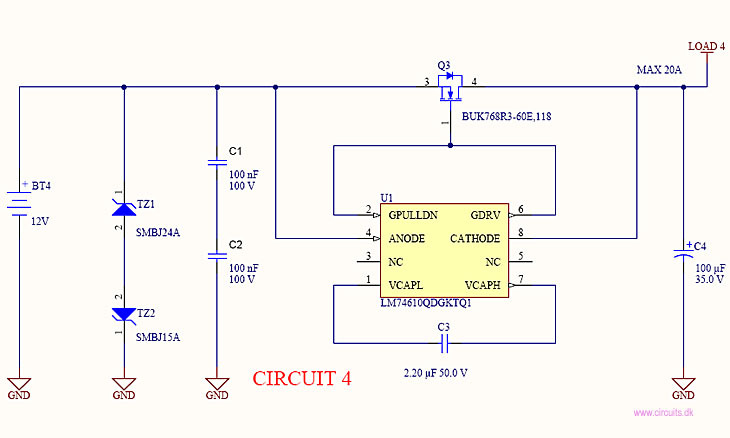 An internal charge pump is used to provide the GATE drive for the external MOSFET. . This stored energy is used to drive the gate of MOSFET. The voltage drop depends on the RDSON of a particular MOSFET in use, which is significantly smaller than a PFET. The LM74610-Q1 has no ground reference which makes it identical to a diode. The TZ1 and TZ2 are not required for the LM74610-Q1. However, they are typically used to clamp the positive and negative voltage surges respectively. The output capacitor Cout is recommended to protect the immediate output voltage collapse as a result of line disturbance. C1 and C2 supress high frequency noise in addition to function as ESD clamps. 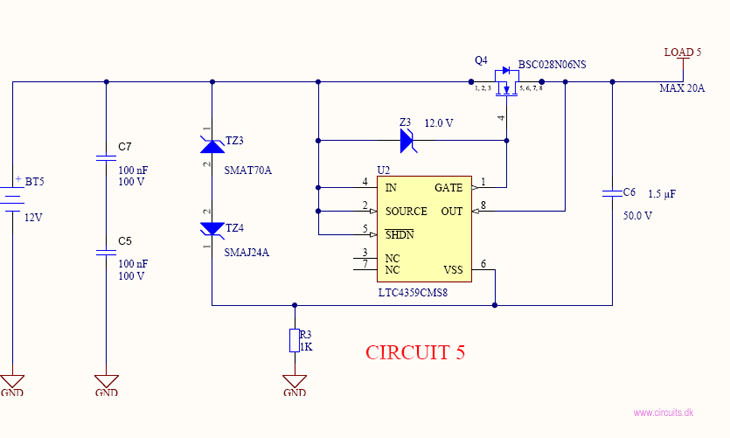 The LM74610-Q1 can provide up to 5V of gate to source voltage (VGS). The important MOSFET electrical parameters are the maximum continuous Drain current ID, the maximum drain-to-source voltage VDS(MAX), and the drain-to-source On resistance RDSON. The maximum continuous drain current, ID, rating must exceed the maximum continuous load current. The rating for the maximum current through the body diode, IS, is typically rated the same as, or slightly higher than the drain current, but body diode current only flows for a small period when the charge pump capacitor is being charged. The voltage across the MOSFET’s body diode must be higher than 0.48 V at low current. The body diode voltage for a MOFET typically decreases as the ambient temperature increases. This will increase the source current requirement to achieve the minimum body diode drain-to-source voltage for the charge pump to initiate. The maximum drain-to-source voltage, VDS(MAX), must be high enough to withstand the highest differential voltage seen in the application. This would include any anticipated fault conditions. The LM74610-Q1 does not have positive voltage limitation, however, it is recommended to use MOSFETs with voltage rating around 45V for automotive applications. The LTC®4359 is a positive high voltage, ideal diode controller that drives an external N-channel MOSFET to replace a Schottky diode. It controls the forward-voltage drop across the MOSFET to ensure smooth current delivery without oscillation even at light loads. 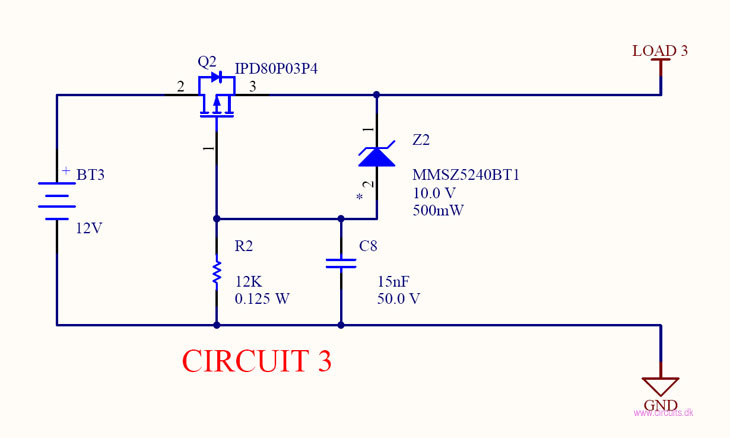 If a power source fails or is shorted, a fast turn-off minimizes reverse current transients. A shutdown mode is available to reduce the quiescent current to 9μA for load switch and 14µA for ideal diode applications. When used in high current diode applications, theLTC4359 reduces power consumption, heat dissipation, voltage loss and PC board area. With its wide operating voltage range, the ability to withstand reverse input voltage, and high temperature rating, the LTC4359 satisfies the demanding requirements of both automotive and telecom applications. The LTC4359 also easily ORs power sources in systems with redundant supplies. The LTC4359 controls an external N-channel MOSFET to form an ideal diode. The GATE amplifier (see Block Diagram) senses across IN and OUT and drives the gate of the MOSFET to regulate the forward voltage to 30mV. As the load current increases, the GATE is driven higher until a point is reached where the MOSFET is fully on. Further increases in load current result in a forward drop of RdsOn x ILOAD. 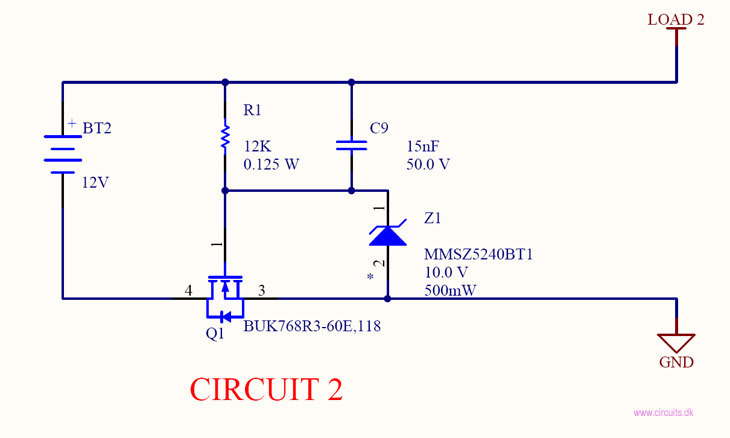 If the load current is reduced, the GATE amplifier drives the MOSFET gate lower to maintain a 30mV drop. If the input voltage is reduced to a point where a forward drop of 30mV cannot be supported, the GATE amplifier drives the MOSFET off. In the event of a rapid drop in input voltage, such as an input short-circuit fault or negative-going voltage spike, reverse current temporarily flows through the MOSFET. This current is provided by any load capacitance and by other supplies or batteries that feed the output in diode ORing applications. The FPD COMP (Fast Pull-Down Comparator) quickly responds to this condition by turning the MOSFET off in 300ns, thus minimizing the disturbance to the output bus. The IN, SOURCE, GATE and SHDN pins are protected against reverse inputs of up to –40V. The internal comparator detects negative input potentials at the SOURCE pin and quickly pulls GATE to SOURCE, turning off the MOSFET and isolating the load from the negative input. When pulled low the SHDN pin turns off most of the internal circuitry, reducing the quiescent current to 9µA and holding the MOSFET off. The SHDN pin may be either driven high or left open to enable the LTC4359. If left open, an internal 2.6µA current source pulls SHDN high. Blockingdiodes are commonly placed in series with supply inputs for the purpose of ORing redundant power sources and protecting against supply reversal. The LTC4359 replaces diodes in these applications with a MOSFET to reduce both the voltage drop and power loss associated with a passive solution. The curve shown on page 1 illustrates the dramatic improvement in power loss achieved in a practical application. This represents significant savings in board area by greatly reducing power dissipation in the pass device. At low input voltages, the improvement in forward voltage loss is readily appreciated where headroom is tight, as shown in Figure 2. The LTC4359 operates from 4V to 80V and withstands an absolute maximum range of –40V to 100V without damage. In automotive applications, theLTC4359operates through load dump, cold crank and two-battery jumps, and it survives reverse battery connections while also protecting the load. 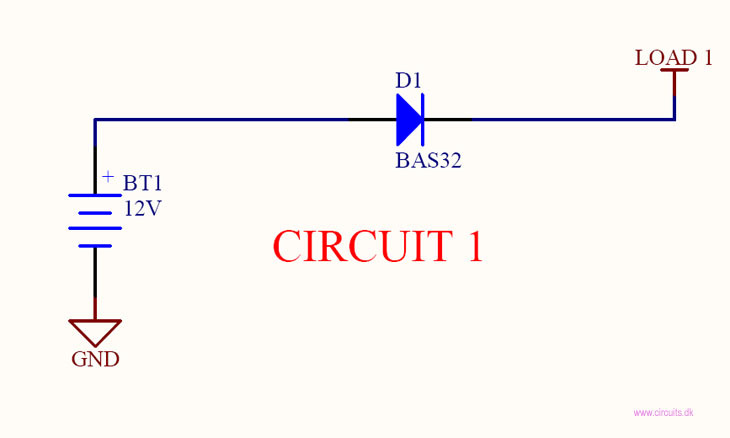 A 12V/20A ideal diode application is shown in Circuit 5. Several external components are included in addition to the MOSFET, Q1. Ideal diodes, like their non-ideal counterparts, exhibit a behavior known as reverse recovery. In combination with parasitic or intentionally introduced inductances, reverse recovery spikes may be generated by an ideal diode during commutation. D1, D2 and R1 protect against these spikes that might otherwise exceed the LTC4359’s –40V to 100V survival rating. COUT also plays a role in absorbing reverse recovery energy. Spikes and protection schemes are discussed in detail in the Input Short-Circuit Faults section. It is important to note that the SHDN pin, while disabling the LTC4359 and reducing its current consumption to 9µA, does not disconnect the load from the input since Q1’s body diode is ever-present. A second MOSFET is required for load switching applications. Using a proprietary chip such as the LTC4349 and theLM74610 saves some of the design work so you will have a working solution with less effort – but at a higher component cost compared to a discrete solution. And, if you are designing for an automotive application, you need to ensure that your design meets the requirements of appropriate standards such as ISO7637-2.